Roadside Assistance Hebbville | Towing | McCarthy’s Towing & Recovery Ltd.
Have a flat tire? Been locked out of your vehicle? Been in an accident? Dealing with a vehicle rollover? 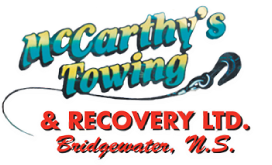 McCarthy’s Towing & Recovery Ltd. in Hebbville can help. We’re fully certified and insured to handle towing and roadside assistance for all types of vehicles and equipment from cars to trailers to boats. Call McCarthy’s Towing & Recovery Ltd. for 24/7 towing today!